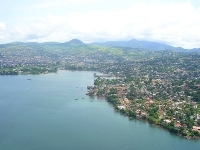 Freetown, the capital and largest city in Sierra Leone, earned its name when it was founded in 1792 as a colony for freed slaves. The city, although a commercial centre, offers visitors a base from which to explore the rest of the country. While the tourist infrastructure is underdeveloped, there are some wonderful attractions for visitors without competing with hordes of tourists. The history of Freetown can be discovered at the Sierra Leone Museum, the National Rail Museum, the Cape Sierra Leone Lighthouse, and the colonial stilt houses at Hill Station. For those that crave the outdoors, the Tacugama Chimpanzee Sanctuary is a must-see, located 40 minutes outside of town. However, the trip must be planned in advance, as both a 4x4 and an appointment are necessary to visit. One of the best things to do in Freetown is to hit the beach. Beautiful and largely unspoilt, beaches such as Lunley and Lakka offer accommodation and great amenities. Nearby, the community-driven shops and restaurants at No. 2 River Beach are also worth a visit, as well as the historical fishing villages at Kent Beach. Violent civil war in the 1990s took its toll, but today Freetown is working to regain its vibrancy, and the tourist industry is sure to grow as travellers find this hidden treasure on the West African Coast.